Vivian Isabel Ahrens (née Burt) passed away peacefully on Sunday, January 13th, 2019 at the Elrose Health Centre in Elrose, SK. Vivian was born to Jim and Isabel Burt in Rosetown, SK on April 11, 1924. She met the love of her life when she was 15 and four years later, she married Donald William Ahrens on July 7, 1943. They moved to the family farm ‘north of the creek’ in the Camberley District where they settled and began their family. They soon moved into the ‘big’ farmhouse and remained there until they built a new home and moved into Rosetown in 1979. Mom’s life was very busy with raising four sons Burt, Keith, Fred and Jim and two daughters Merla and Margo. She kept herself busy with always making sure that there were fresh buns and lots of cookies on hand for all of those kids! She also kept herself busy with sewing clothes so that she and her daughters could look alike, as well as with many quilting bees held in the front room. Mom also enjoyed spending her summer month of July at their cottage at Aquadeo Beach where they vacationed for 25 years. Many Saskatoon berry pies were made at that cottage along with corn roasts and lots of visiting at the backyard campfires. One of mom’s great loves was singing – she loved performing in the town musicals such as - The Sound of Music and Oklahoma, as well as sharing her gift of song at many weddings, and with the church choir. Mom enjoyed her time golfing, playing bridge, Dance Club on Saturday nights, as well as participating in the Rosetown Music Festival and volunteering on many church committees. She also enjoyed selling Tupperware and working at Flair Fashions in Rosetown. As time went on, the family grew and Mom welcomed all the ‘add-ons’ and of course the grandchildren and great grandchildren. Mom was predeceased by her husband Don (2006), her daughter Merla (2015) and her son Fred (2015). She was also predeceased by her parents James and Isabel Burt, brothers Austin Burt and Tom Burt and sisters Inez Fraser and Eileen Edginton. She is survived by her son Burt (Marlene) Ahrens and their children: Trevor (Heather) Ahrens and great-grandchildren, Dylan and Emma and Brent (Char) Ahrens and great-grandchildren Tyler (Kayla Martens) and Jenna; her son Keith (Linda) Ahrens and their children: Michael Ahrens (Sandy Tsai), Jill Ahrens-Gruetzner (Bert Gruetzner) and great-grandchildren Jordan, Sydney and Hayden; her son Jim (Dianne) Ahrens and their daughter Ashley (Justin) Houston and great-grandchild Bodhi; her grandchildren: Janine Walker, Julie (Robbie) Adnam and great-grandchildren Kaylee and Quinn and Lindy (Ryan) MacLeod and great-grandchildren Waylon, Declan and Jake; her daughter Margo (Larry) Achtemichuk and their children: Janelle and Lauren (Tor Lokken) Achtemichuk; her sisters Wilma (Keith) Coffin and Joy Geddes as well as numerous nieces and nephews. The family extends thanks and appreciation to the Elrose Health Centre for their wonderful care of mom during the past three years. 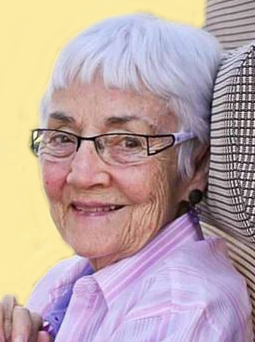 A Celebration of Vivian’s Life was held on Thursday, April 18, 2019 at the Rosetown United Church at 2:00 p.m. with Reverend Jo-Ann Hills officiating. Memorial donations may be made to the Rosetown United Church, P.O. Box 506, Rosetown, SK, S0L 2V0 or to the Alex Ositis Foundation, P.O. Box 1251, Rosetown, SK, S0L 2V0.